Do Not Steal the Turtles! 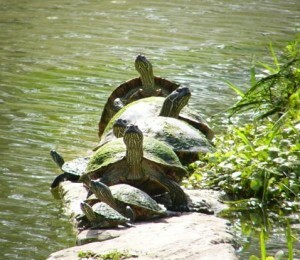 Several reports have drifted my way of turtles being removed from the pond in Northwest Park. It is illegal to collect a turtle from public waterways. If you see anyone gathering turtles call 311 immediately to report the theft. Please (please) insist on filing a theft report. Do not just leave a message. Most turtles in NW Pond are herbivores, they help manage the plants in the pond. They do not harm the fish population. A lot of the species that you see in NW Pond will grow too big to be kept as pets, once you bring that turtle home.. you cannot release it back into the wild. The above photo was taken Sunday morning, 5.24.09 at the Northwest Park pond.